Leprosy (Hansen’s disease) is caused by a bacterial infection which later manifests as damage to the skin and peripheral nerves. Transmission is likely to be via respiratory droplets or close skin-to-skin contact. The disease is dreaded because of its highly visible disfiguring nature ranging from horrible skin lesions and hand clawing, to severe injuries that occur secondary to weak and anaesthetic hands and feet. Deep wound infections that may lead to amputation, osteomyelitis and blindness, devastating for someone already lacking touch sensation, are some typical complications. Patients commonly present with hypopigmented skin lesions, glove and stocking numbness or weakness caused by larger nerve involvement or more rarely a painless burn or ulcer in an anaesthetic hand or foot. Worldwide, 2 million people are estimated to be disabled by the consequences of leprosy. The clinical signs and symptoms of leprosy are due to chronic infection by the bacilli Mycobacterium leprae and Mycobacterium lepromatosis. These slow dividing mycobacterium evolved to be obligate intracellular parasites leading to skin lesions and nerve damage. The mycobacterium have specific binding proteins that make neural Schwann cells particularly susceptible to infection. Following invasion of the cell, the bacteria bring about their pathogenicity by harming the cellular transcription machinery. Notably, myelin gene transcription is disrupted causing early and accelerated demyelination of peripheral nerves. The host’s inflammatory response to the active infection can further complicate the damaging pathophysiological process. In the absence of efficient clearance by cell-mediated immunity the disintegrating organisms provide a persistent antigen reservoir, triggering hypersensitivity reactions that also lead to axonal injury and impaired nerve conduction. The infection can be successfully cleared with a 12-month multidrug antibiotic treatment (MDT) regimen of rifampicin, clofazimine and dapsone with relapse rates being low. However nerve damage can occur before, during or after MDT and unfortunately many patients and their communities often do not view an individual as cured if any acquired disfigurement persists. Hypersensitivity reactions are managed with a course of corticosteroids; often prescribed long-term they bring another set of side effects and complications. 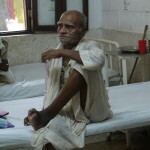 In short, dealing with leprosy is not simply a matter of treating the infection. It also requires the prompt management of reactions causing further damage that may occur even after a course of MDT has been finished. Typical in endemic nations; fearful of infection, a cured but disfigured individual often still suffers social stigma and marginalisation from society due to poor understanding about the disease. Dealing with the complications of neuropathy, eradicating associated social stigmas, and minimizing the impact of the disease on physical, psychological and social well-being is therefore all vital. As of the beginning of 2012, leprosy control programmes in many endemic countries are sustaining their activities successfully and the number of new cases detected globally continues to decline each year. Nepal is known as a leprosy endemic country and is one of a few nations left in the world that has yet to achieve elimination (incidence of < 1 in 100,000). For these few nations, sustaining political commitment and mobilizing funding to maintain services in the field for leprosy control activities are major challenges to achieving disease elimination. Nepal Leprosy Trust (NLT) is a non-profit christian organisation that is working towards holistic care of people affected by leprosy. The Lalgadh Leprosy Services Centre (LLSC) run by NLT in the Terai region is unofficially revered as the busiest specialist leprosy hospital in the world seeing over 1000 new cases each year. The Terai region has the highest prevalence of leprosy, and previously had very limited referral services to help them. This became a matter of concern to NLT, and after almost 10 years of negotiation and discussion with the Nepalese government, NLT was given permission to start its new work at Lalgadh. LLSC works in cooperation with the government, local communities, partner health organizations, local non-government organisations, many international donor partners and most importantly, people and communities affected by leprosy. The services provided by LLSC include integrated curative and rehabilitative services, community health services, training, administration, logistics and technical support services. 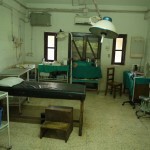 It offers free inpatient and outpatient care along with community-based empowerment rehabilitation. The major principle in all of NLT’s activities is to reduce the stigma that wrongfully and unjustly surrounds leprosy. It is aimed to promote the full participation in society of all those affected, including family members. While being specialist particularly in the area of dermatology LLSC also provides for general medical cases that range from road traffic accidents and orthopaedic trauma to malaria, meningitis and dysentery. I am far from certain of any specialty training I might want to do and where I might want to practice my future skills in medicine. However what I am sure of is how quickly time flies and before I know it I will be faced with these important decisions! What I believe is best for me therefore, is to use some of my spare time in a useful way that might help me make a better informed decision. Working abroad in the field is certainly under consideration, thanks to inspiration from my late grandfather who, for a long time, was a missionary doctor in Zaire (now D.R. Congo). His incredible stories of delivering medicine in some extreme situations and conditions in tandem with my admiration of his work planted the interest I have today in global health, in essence the medicine of poverty. I wrote in my application to the NLT and to the Royal Medical Society (RMS) that in the summer I was seeking to be challenged by stepping out of the comfort zones and insulation of home, and to get the opportunity to get another view of myself in an unfamiliar environment. LLSC provided a great opportunity to learn about grassroots healthcare and gain an improved perspective on healthcare challenges faced by people in the developing world. It offered a chance to participate in an effort delivering care to people in very great need whilst remaining within the remit of a medical student. I wanted to provide assistance in any way possible that had some kind of positive impact, be it freeing up the hands of experience staff to do other work. I also had an opportunity to receive clinical teaching, conduct minor procedures, and assist in more major ones. I shadowed, learned and worked at LLSC for 6 weeks in the summer of 2011 and on promptly returning to year 2 of the medical course at Edinburgh, I had been left emotionally concussed. I do not have the writing poise and skill to describe everything that I learnt from my time at Lalgadh and I have struggled to articulate my experience for the few who have asked. Leprosy, no longer a scourge in the western world, recently got mentioned for the first time in our teaching at Edinburgh for a brief 10 seconds; my 6-week experience was wrapped up in that passing comment, quickly forgotten by most. The personalities at LLSC I got to meet and their work have made a lasting impression on me, going as far as shaping some of my outlook on life. Perhaps most striking of all was the innate resilience of the people. Pain, suffering, some backbreaking work, it’s the way of life. There were virtually no tears in hospital be it a painful procedure or a family’s bereavement. The staff there work unspeakably hard, at a whole other level, every day, with little rest, an aspect hard to fathom. Spare time would often entail learning advanced english, studying for additional medical diplomas and more. The children were diligent in all their schoolwork and some of the younger patients receiving schooling were tackling maths I would never have done at their age! One thing they really value is education and any opportunity to learn. I sensed that they would have given anything to be in the position I was in, but tens of thousands of pounds upfront is certainly not at their disposal to pay for medical school. I already feel enormously lucky to be in a UK medical and very privileged to be a part of the profession, but having seen how much others want it, and who will probably never get the chance, I have learned I really ought to work my hardest and make the most out of all the opportunities I receive. The doctors, nurses, physiotherapists and lab technicians live and work in relative isolation in terms of getting support from the wider medical community for complicated cases. By UK standards they are extremely under-resourced. Sticky gauze bandages tear aware the healthy healing skin each time they need to be changed (often revealing numerous maggots!). I was asked to bring out Land Rover parts in my baggage, continue wearing and washing my gloves between patients in wound care, and witness excruciating procedures, such as cleaning deep abscesses and reducing fractures, when precious ketamine would have to be spared. Seeing the psychotic effects of ketamine on a toddler having fracture pins removed is not exactly pleasant either. On venturing into nearby towns, our unusually large frames attracting a lot of attention from locals, I was startled at the strong sense of community and saw how strength within the family was important in coping with some of the impoverished living. In the hospital it was an environment of patients helping other patients with dressing, cleaning and eating; all quite different from home. The WHO classifies Leprosy as a neglected disease that fails to attract funds from organizations that want quick or dramatic results. Delays in presentation, diagnosis are treatment renders sufferers progressively disabled and awful, and even hideous to look at. The doctors at LLSC explained that unfortunately the tragedy is not just infection with the mycobacterium per se, but society’s reaction to these people. They become “untouchable” (even by health staff) twisted, ulcerated and infected. They marginalised, ostracised, and banished from their families and communities. The progressively disfiguring and disabling ulcerating nature, along with the stigma and rejection that goes with it mean people call it a “living death”. Unfortunately but perhaps inevitably I, along with other medical students there, became attached to a particular 10 year old boy being treated for his hypersensitivity reactions having been cleared of infection. He was fun-loving, outgoing and full of joy. He was also can’t have been much more than 4 feet tall and it was heart-breaking to hear his prolonged steroid treatment meant it was unlikely he would grow much more, making employment and marriage prospects bleak. 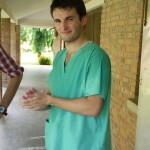 The doctor and nursing staff were excellent teachers and were always more than happy to let me get involved. I frequently assisted in surgery and was given sufficient training in wound care and prescribing to be left to work in that clinic fairly independently. I did however feel a little uncomfortable around their motto of ‘see one, do one, teach one!’ and made sure to conduct myself within an appropriate ethical remit as a medical student. For the more medically inclined, the following is a few examples of general things I saw and sometimes helped with: TB, dysentery, disseminated intravascular coagulation, severe panic attacks, mother and child clinic, tibialis posterior transfer surgery, surgeries for lipoma, melanoma, amputations, septic surgery procedures, vitiligo, tinea, emergencies such as the aftermath of two RTAs, snake bites, 60% third-degree burns…. the list goes on. I got a glimmer of what it might be like to work in grassroots healthcare and my well-organised visit to LLSC with great teaching and the most loving and caring welcome I could imagine provided fantastic insight into what it can be like to work as a medic in this context. I want to take the opportunity to thank both the RMS for their financial support and to NLT for making me feel so welcome and included.